Looking for school holiday ideas for the kids? Steamrail Victoria invites you to enjoy nostalgic steam train journey from Melbourne to BACCHUS MARSH where family fun and relaxation awaits you. Board our historic steam train from Southern Cross Station. Our train recreates the golden era of country passenger trains from half a century ago, a great learning experience for the children. These carriages feature timber panelling, walk through corridors, comfortable compartment style seating with opening windows, toilets and washrooms, and a fully stocked Buffet car. 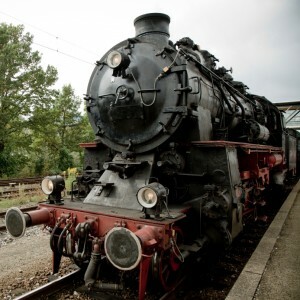 The train will be hauled by one of Steamrail’s historic steam locomotives. Our steam train will make additional stops for intermediate passengers wishing to board at North Melbourne, Footscray and Sunshine. Enjoy a journey across to Bacchus Marsh, travelling on part of the new Victorian Fast Rail Network. Once in Bacchus Marsh, there is the opportunity to explore this old style town at your own leisure. The kids can visit the famous adventure playground at Maddingley Park right opposite the railway station. Steeped in history, this park was set up approximately 135 years ago as the local “police paddocks” for care of their “mounts”. With the passage of time and the planting of many elms, plus nurturing and care, this magnificent park has been created as an oasis for kids. The facilities are many and varied with free tennis courts, cricket oval, band rotunda and numerous pieces of playground equipment to keep the children amused. Our departure at 1.05pm will see us heading back to Melbourne, so settle back in your compartment as our train charges out of the Werribee River valley heading east on a course for home. Our on-train facilities include a buffet car, which stocks a wide range of light refreshments, souvenirs, hot and cold drinks.